All opinions are welcome!! That is the only way to capture the audiences reaction online. Really. 9 is an awesome mix also. Except for the Inside Me song and I hear were your coming from. But if your looking to get backers that could possible turn some off. In the clubs it is fine. But remember that young people (12 - 15) are down loading your mixes and if there parents hear it then they could possibly ban your site. Or buying you mixes in the future. I don't want to come across as a square. I'm looking at it from what could possible stop you from being promoted. But again. You picked songs that are never played and have added a sound that is Project C. Your mixes are certainly different from the rest of the DJ's and I encourage you to keep spinning the way you are. It makes your mixes unique. Thanks again ewe_2! I never looked at it that way. Gotta watch out for the kids!!! I liked the "inside me" track. 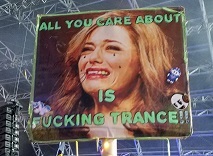 I think trance music is about expression and emotion. I love the way the DJ can play a set and tell a story at the same time. This set rocks! How do we know how old peeps are? Every time I try to d/l this session I only get 44k worth of mp3. Has anyone got an idea wot the prob is? My first post and its going to a very nice mix. Awesome work. I can't wait to listen to some of the other mixes. Great work. Well, you gotta listen to 8. It's life changing. For the better! Hey! It's playing right now. Someone said too proggy but, like, expand your tastes! It's not a stretch. Wow, I love these comments bout life changing for the better stuff that's going on!! especially when it's for the better!!! Riding a wave of bliss on this. And the mix was so smooth. I think someone pointed out the transition between the 1st and 2nd tracks already - listen close on 01. Alucard Pres 49th Line ft Jennifer Grimm - Blue on Blue (Hydroids Dream Mix) (unmixed, at about 7:25) some time and catch the faint pizzicato at the end - that's picked up with the opening string pluck of 02. Morgan Page Featuring Astrid Suryanto - Falling (Main Mix). That's attention to detail. That's what makes a great selection of tracks a mix that is greater than the sum of the great parts. Excellent! Another one down the rabbit hole. & yes Project C I *was* lauding mix 8. Not that stoned. 9 is good too. & 7 & 6 etc. BTW, "Not bad!" is listed twice in your poll.